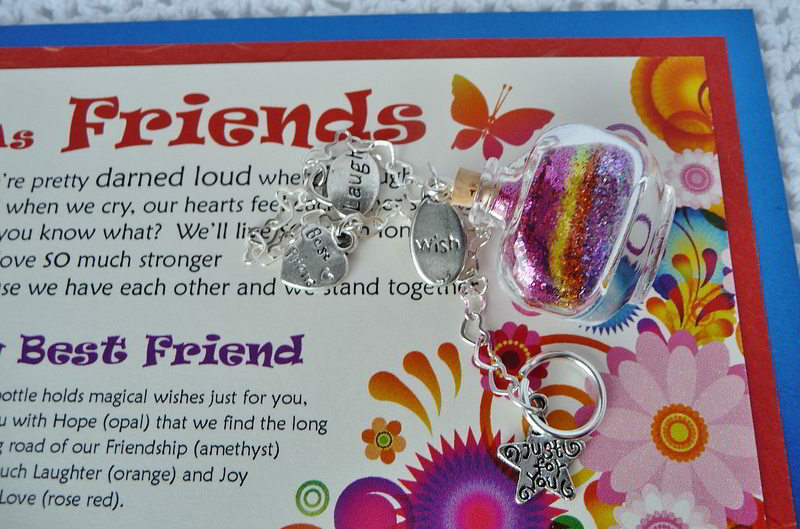 Unique friendship gifts are the perfect solution for expressing how happy you are to have them as such a good friend. Friendships are very special relationships. Many times our friends are closer and mean more to us than any other relationship, including our spouse or family members. As your friendships take their course, there will be times when you feel like you would like to show your friend how much they mean to you. A friend is someone you can trust, someone that understands you and will listen to all of your successes or problems without judging you or offering unsolicited advice. Sometimes you may ask your friend for advice, but many times you may just need them to be there for you – they are that someone who will just listen and give a good ear to you and all that you have to say. Really good friends understand the difference between when you need advice and when you just need to let off some steam. A good friend allows you to vent, rave, rant, cry, whatever it takes to make you feel better. You return this friendship by being there for your friend, but sometimes you feel like you want to give a little more, especially when they go above and beyond the normal duties of friendship. You may feel like giving them a small token of your appreciation. A unique friendship gift they will cherish forever. A Captured Wishes gift is just the thing. 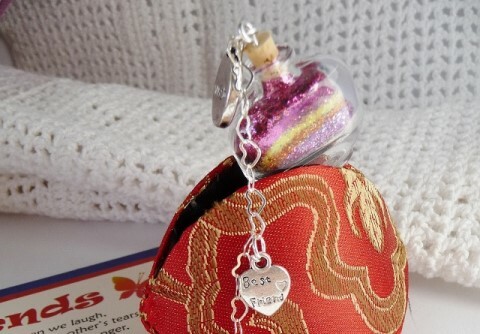 Captured Wishes gifts are super cute little bottles, mini wishing vessels filled with brilliantly colored magic dust delicately layered to represent what you feel in your heart. Layers of love and friendship and your hopeful thoughts and wishes show your friend how much they mean to you, to show them how thankful you are to have such a special friend in your life. 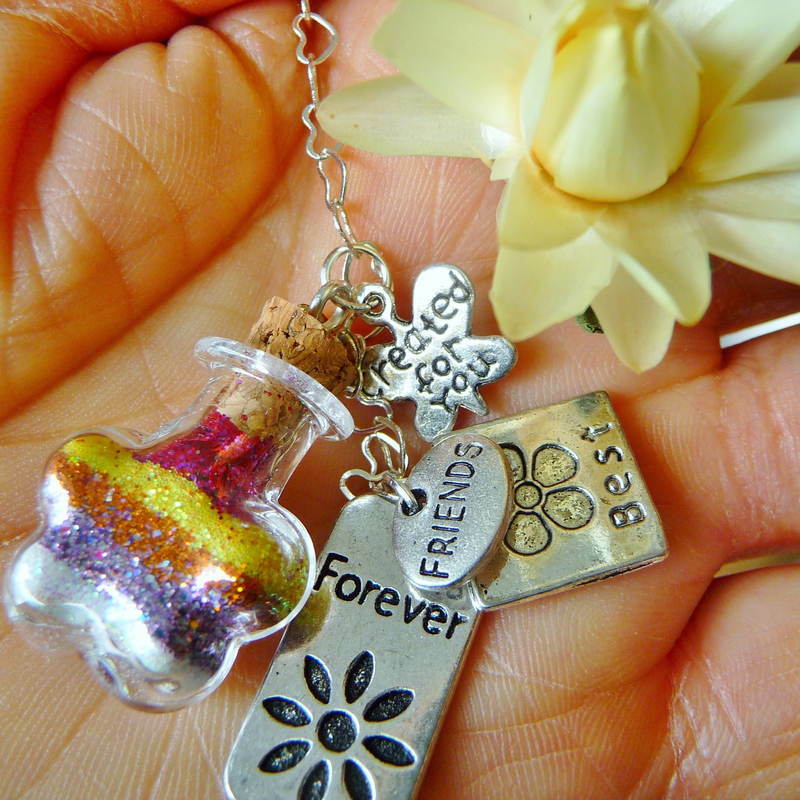 This special friendship gift allows the receiver to make all the wishes they like, anytime they desire. Guaranteed to put a smile on your friend's face because of the thought put into it, this unique vessel is sure to be favored as "the gift worth keeping". These unique friendship gifts come adorned with super special charms anchored to delicate chain formed in heart links encircling this little magical vessel. Best of all, there is an inspirational verse included that is guaranteed to warm the cockles in your friend's heart. It will be all too clear how much value you place on their friendship. Customized Captured Wishes gifts allow the person receiving it to feel far more appreciated and unique than any other gift ever can. 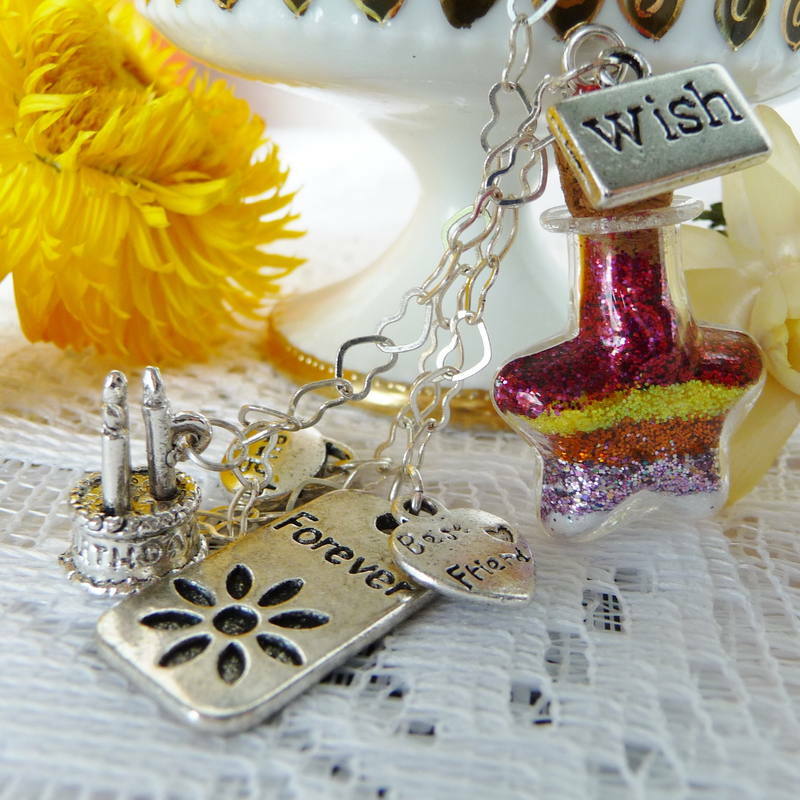 The greatest thing about Captured Wishes gifts is that each one is specially handcrafted, which makes each one totally unique and ideal for any occasion. Whether for a birthday, a graduation, a baby shower, an anniversary, a wedding, or any occasion at all, a magical Captured Wishes gift is always the perfect choice. When you give a Captured Wishes gift, you are giving a piece of your heart. This is a physical expression your special friend can hold, and wish upon to bring back the warm feelings of the friendship between you. To feel the special bond that can only be shared by friends. Your unique friendship gift is carefully crafted and securely packaged to ensure it arrives safely. You will never forget the glow in your friend's eyes when they open this ultra cute gift. Unique friendship gifts are filled with love, and care. Show your dear friend that you care with a chic and unique Captured Wishes gift. When you want to surprise your best friend with unique friendship gifts, think Captured Wishes. There is nothing more unique or more special than the love that comes with friendship, and this gift shows your love better than anything else.